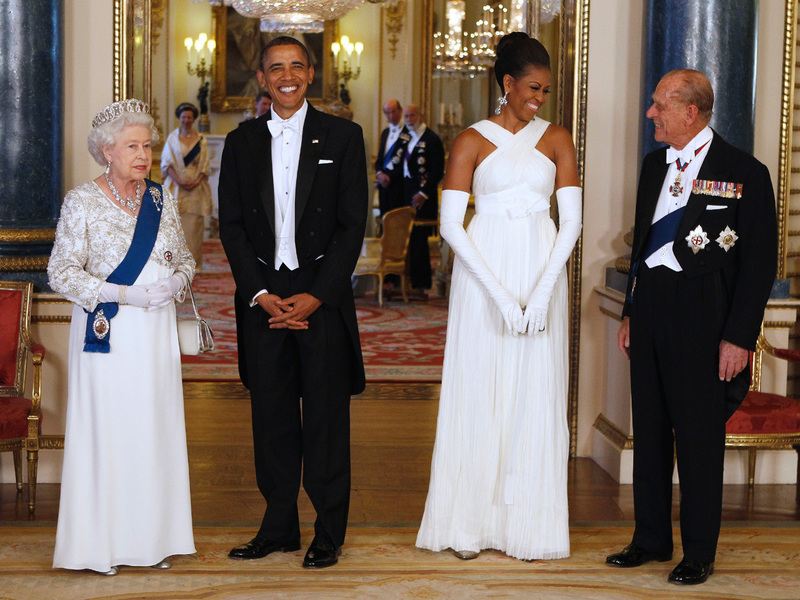 (CBS/AP) LONDON - President Barack Obama and first lady Michelle Obama wrapped up their first day in London with an elegant state banquet at Buckingham Palace, as guests of Queen Elizabeth II. The first lady wore a white gown by American designer Tom Ford, which she paired with white gloves and long drop earrings. Mr. Obama donned a tuxedo with a white bow tie and an American flag pin on his lapel. The evening's 171-person guest list includes members of the royal family, celebrities and other dignitaries, including Prince Charles and the Duchess of Cornwall, Secretary of State Hillary Clinton, Prime Minister David Cameron, Deputy Prime Minister Nick Clegg, former Prime Ministers Tony Blair and Gordon Brown, Labor Party leader Ed Miliband, Richard Branson, Mayor of London Boris Johnson, historian Doris Kearns Goodwin, actors Kristin Chenoweth, Tom Hanks and Rita Wilson, director Tim Burton, actress Helena Bonham-Carter, and actor Kevin Spacey. The china used at the gala reportedly dates as far back as 1787. Some were made for Queen Victoria, (sweet plates in 1876) while other pieces are a bit older (green sevre- soft paste porcelain made for Louis XVI in the 1790s). Guests will dine on a menu that includes new season lamb, roasted potatoes and a vanilla charlotte, along with a variety of wines (scroll down for the full menu). Seated at the president's table are Mrs. Obama, the Queen, Prince Philip, Prince Charles, The Duchess of Cornwall, Clinton and Cameron, with the monarch and Mr. Obama at the head of the U-shaped table. The queen opened the dinner by recalling fond memories of her earlier meetings with the Obamas. She added that the U.S. and Britain in most cases see world problems in the same light, and that the U.S.-U.K relationship is - in her words - "tried, tested and, yes, special." Mr. Obama is only the second U.S. president to be accorded a state visit in Britain during the reign of Queen Elizabeth II, according to Buckingham Palace. Although most previous presidents have visited England and met the queen, a number of features are required by British protocol in order for the trip to be considered a state visit. George W. Bush is the only previous U.S. president to be accorded a state visit, the palace said.